Make whipped banana oats as usual and near the end of cooking add cubes of delicious whole wheat bread and a splash more milk. Stir until liquid is absorbed. Enjoy big luscious bites of bread cubes throughout! Remember when I did this with Apple Crunch a while back? I haven’t stopped thinking about it! But we haven’t any good fruity Great Harvest bread in stock for a while. So glad I remembered this time! Have you heard of Ebates.com? It’s a site that pays you CASH BACK just for making your usual shopping purchases online. It works because they get paid by the company for referring you and share some of it. Tina introduced me a while ago, and I have to say I’ve been shopping online a little more than usual – they have really good coupon deals too! I was all out of Bare Minerals and paid a visit to Sephora.com (4% cash back) and also bought another of my new favorite sports bra from Fresh Pair (Moving Comfort Fiona). Two necessities – with a bonus! And I think you even get $5 just for signing up. I’m excited to see if this really adds up over time! We’ve got a beautiful sunny day here before a string of rain in the forecast, so Matt and I are going for a nice run later on. First – computer work! I’ve never heard of ebates — sounds like a great idea! 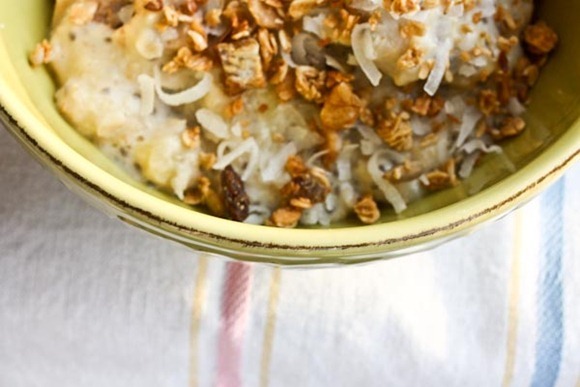 Your bread pudding oats look delicious! 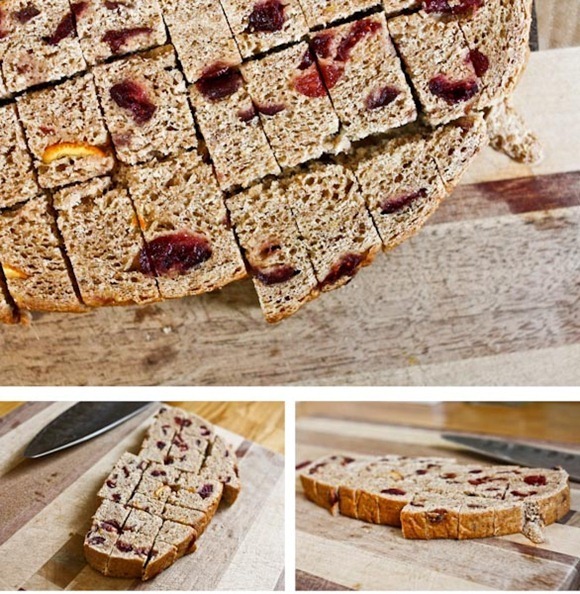 Cranberry Orange bread sounds so yum! I just started using Ebates.com and LOVE it! I also read about it on Tina’s blog Carrots N’ Cake. So cool. I’ve never heard of Ebates, but I do shop online a lot. I’m going to go check it out now. Thanks for the tip! And by the way, Bare Minerals is pretty much all I use. I love it. Your a woman after my own heart! Oh my oatmeal – that looks so good. You are an oatmeal goddess. yum. I would definitely add egg to that and bake it! awesome looking either way! I love Ebates and use it as often as I can. Love the use of bread in your oats. It definitely feels to to make something delicious out of leftovers. So now that I have my whole family hooked on whipped banana oats (thanks to you), I’ll be blowing their minds by adding some fabulous cranberry walnut bread. Great idea! Ohhh the bread thing is SUCH a good idea!! Wow, definitely going on my list of breakfasts to try!! Never heard of Ebates, I’ll have to check it out! I am always so weary of those kind of deals. Oatmeal looks delicious…off to make my own bowl! I must have missed your bread pudding last time! Such a great idea. I will have to see if ebates has my usual stores on there. Bread in oatmeal, sounds like a meal fit for my husband for sure!! He could eat both all day everyday. Mmmmm, bread pudding is good in any form!! Looks like a tasty start to the day! I Love Ebates! What a unique breakfast! I haven’t seen anything like that before. Wow, talk about party in a bowl! Amazing idea. I’m sure you’ve answered this before, but I was wondering if you ever get a “sugar crash” from your oat/banana/granola breakfasts? I always admire your breakfasts, but am hesitant to try them because I’m usually intimidated by big meals. I’ve never experienced any kind of sugar crash with oatmeal – but I have when I eat too many sweets! I think because my breakfasts include good amounts of fiber, protein and fat that the glycemic is pretty slow and steady. I’ve been meaning to try ebates. Of course, it’s always right after I place an order at Sephora that I remember about it! That breakfast is such a good idea! I don’t usually buy the fruity bread..but I may buy some try try this out! I don’t use ebates but I do use mrrebates. There are several similar companies out there. I have made probably $50 to $70 so far, since my son has ordered a few pair of expensive shoes on the internet; that helps it add up. Some other examples – you can also buy plane tickets through Priceline and buy things on ebay and get your account credited. Then they send you a check! Cool! I’m such a skeptic when it comes to sites like that! Right now I use Clinique, but I’m almost out and thinking of switching to Bare Minerals. My friend uses it and LOVES it. Would it be wise to go into the store to buy it the first time, so that they can figure out my skin tone? Or does it work that way? Go to the store! It will be worth it to get the exact shade. I LOVE BM! I agree with Kath, go to the store and make sure you get the right shade. And they’ll give you a make-under, which is nice. Kath, you and Matt are such a wonderful face for Great Harvest. I was having dinner with my sister last night and she is a huge GH fan. I was telling her about your blog and about the process you guys have gone through to open the store. Then I was saying how I read on your GHCville website that you mill the flour fresh every morning and my sister had this massive “no wonder it tastes so good!” moment. It would be divine with Cinnachip!! So addicted to GH bread now in Newtonville, MA. I live in fear of it closing, so I’m on a mission to patron it bi-weekly. I asked on Sunday if they’d heard of the blogger in VA giving GH such good press. Do you think the bread oatmeal would work with cinnamon chip? Oh my! Bread pudding oats -you are a genius!! Yes! I’ve done this with both hot oats and overnight oats, and the added chew from the bread is fantastic. I think I actually love it even more when I stir muffin or quick bread crumbles into yogurt and let it sit overnight. Doughy deliciousness! I hate it when people throw away the ends of loaves. They are PERFECT for bread pudding!!! 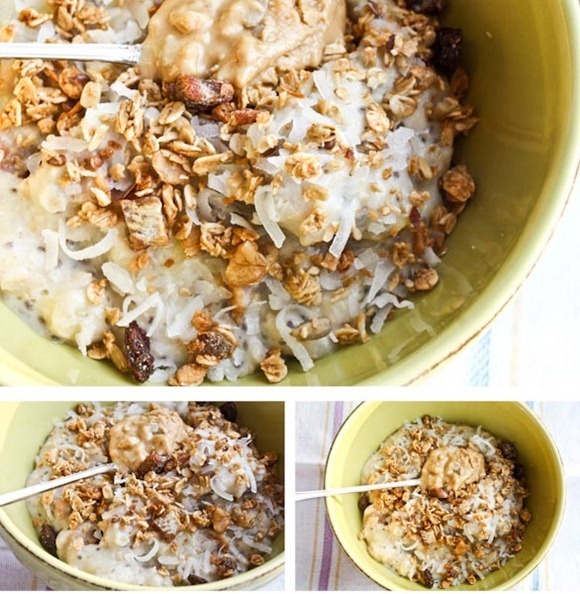 What an amazing oats idea! I am in oat love! Sounds delicious! I hit our Great Harvest on Sunday (there was a coupon in the paper for a free loaf of Cinnamon Swirl with the purchase of another loaf!). The Irish Soda bread was delicious…I cut up the crown shape it was in and froze most of eat. I can’t keep it out or I eat too much! I may have to pull a slice out of the freezer and try this! Never tried ebates but I am now hooked on groupons.com and livingsocial.com…..so much easier to justify things when they are half off!!! I am just in love with your coffee cup! Where did you get it?!? Those oats looking amazing! Bread oats? Is there nothing you can’t do? I’m kind of skeptical about ebates I was using swagbucks for a while, but it became more of a hassle. I heard about Ebates from Tina too and I’ve signed up, but haven’t had a chance to really look into how it works yet. (Just seemed like a good idea at the time, and i figured it was one of those things I’d get back to!) Thanks for the reminder. And LOVELY looking oats this morning. I love bread pudding! Why would you be low carbing!? Amen to that! Carbs rock! Bread pudding oatmeal sounds brilliant. Perfect for days when I know I may or may not get to eat lunch and I need a super-filling breakfast. This recipe looks so delicious and is making me hungry so soon after I have eaten breakfast. I have never been a huge fan of oatmeal because I prefer crunchier textures to smoother, mushier textures. However, I have come across some great variations on oatmeal recipes lately that solve this problem. I love the idea of bread cubes and granola and nuts to add both texture and substance to oatmeal. I recently saw a banana bread oatmeal recipe which also looked enticing. 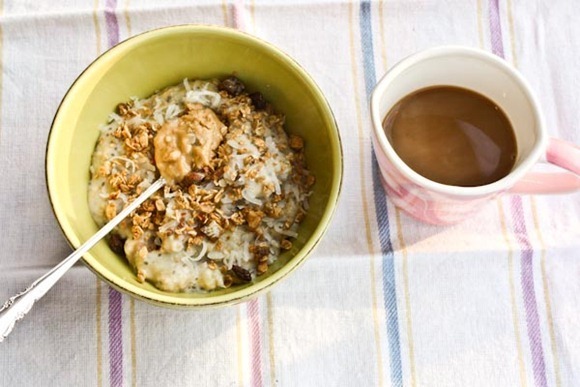 My favorite thing to do is add peanut butter and cinnamon to oatmeal – the combination is amazing! Now I will add some of these crunchier things to make the perfect cruncy and filling oatmeal. I love me some bread pudding!! I think my husband does the ebates thing, I love saving on things I planned to buy anyway. LOVE Sephora! What did you order?? i <3 bare minerals. So, so much! I wish I could love Bare Minerals! Something either in the minerals itself or their brushes makes me breakout like MAD! So sad because it gives such a gorgeous finish. Im so glad my daughter works at Great Harvest! Im going to have her bring me home a loaf of the Cranberry orange bread! Your oatmeal looks good as always! I have a question about RD programs. Did you get a MS + RD certification, or just an RD cert? I am looking into different Universities, and some seem to offer dual programs. Ebates is legitimate! It works best if you’re making a major purchase because then your “ebate” is larger, but I used it for my online Christmas shopping and all the small purchases added up. They also do a “daily double” each day, where they double the amount of the ebate for a particular store that day. They doubled Crate and Barrel this past weekend (from 3 to 6 percent) . And it happened to be the day we planning to buy a sofa there! Instead, I ordered it online (I’d only gone in the store and visited this sofa about ten times in the past few weeks!) The ebate will be about 80 dollars. Not bad, considering we were going to buy it that day anyway! I really wanted to buy some of that Nutty Buddy Peanut Butter since it looked VERY reasonably priced until I added the shipping cost! 10 DOLLARS FOR AN 8OZ JAR OF PEANUT BUTTER?! Is it really worth it? Oh my–such gorgeous bread fills your home!! what a creative idea! all your bread pictures just make me crave bread lately! Ebates is new to me – is it in Canada, too, i wonder? yes – get your work done first, and the reward will be a fun run! i work at a running store and moving comfort is a fabulous line for quality running bras – the fiona is one of the more popular models, i’ve noticed. 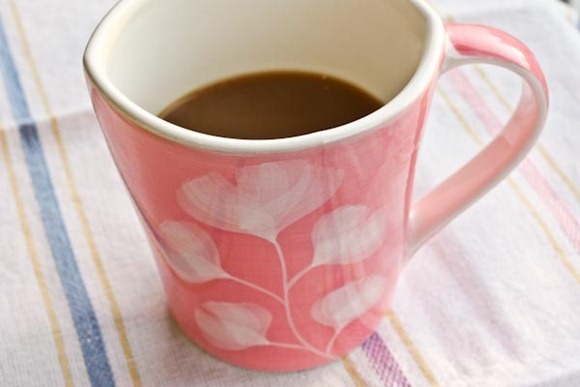 i really like your pink mug! 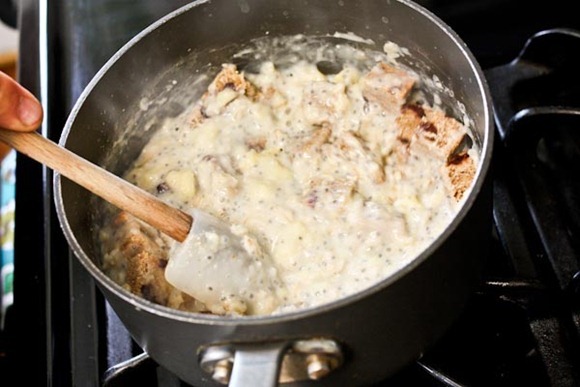 I’ve used GH cinnamon chip before for bread pudding, and it was awesome. Bread pudding oats sounds incredible. What a cool brunch idea too–guests would really be wowwed. Oh.my.gosh. I think you found a way to make me love oats!!!! OMG this looks delicious I love the idea of bread pudding for breakfast. Ive never heard of ebates but ill check it out! 1. Thought about mixing great bread with the oatmeal – genius. So easy yet so genius! I need to get me some sweet flavoured bread! I love ebates! I’ve been using it for about three years. It really pays off when you do your Christmas shopping with it. Last year, I got about $100 back. Not too bad! Can you run in this sports bra without wearing two bras?? I have such a hard time finding a sports bra that keeps me in place while running. I’ve tried the TaTa Tamer and even it isn’t great support. Thanks! I have the Juno, love it! It has a racer back which suits most of my jogging/gym clothes. First jogging bra where I don’t have to wear 2, and it’s not ugly! I like the Phoebe. Something about the Fiona just kills my back on long runs. I think it hits me in the wrong spot. Also annoying is the ribbed torso band. It eats at the skin under my solar plexus. I used to love those bras, but I can’t do more than 4 miles in them now. bread in oatmeal. i’m done! What an awesome idea Kath! I bet it made it nice and chewy and added a lot of volume. I STILL have never eaten oatmeal, but yours looks SO GOOD. Gosh. I know. It’s like we’re from different planets, only a state away (I’m in SC). LOVE the idea of bread into the oatmeal. oh my gosh! thank you for telling me about ebates! i just got the BEST deal ever from restaurant.com with the ebates promotion that was running! $75 of eating out for $7!! Oh wow! I’m going to hunt for that! this breakfast is the perfect comfort food breakfast : ) love the bread addition! U should sell bread pudding oats at GH!!! Bread added to oatmeal, never tried! That is the best looking bowl of oatmeal I have ever seen!!! I definitely need to make this at home. Yours always look amazing! You MUST try this again with your bread TOASTED! My Mom always served us buttered toast with our oatmeal, and we usually broke up the whole slice, or just the crusts, and mixed them into our oatmeal. Experiment with it a bit – you can cut out fat somewhere else to include the butter on the toast, and perhaps up your liquids a bit to account for what the toast will absorb. I serve oatmeal almost every day to my toddlers at home, and we put frozen wild blueberries in at the end to help cool down the oats. The blueberries are like tiny little ice cubes and they add sweetness and a fun color. It helps get the oats on the table and into their hungry mouths faster! Ohhhh I bet that provides such a nice roast!! I do that rebate shopping through AAA. LOVE it!!! The chia seeds link to OpenSky says it’s “no longer active” or something like that. Just fyi. Oh bummer, thanks. They are changing hosts. Also, another great site to use (for when you start having children) is called upromise.com. Basically you sign up and get money back through purchase you make. For example,when you go to the grocery store you might get 10 cents back for purchasing sugar. Well, over time that adds up and all of the money goes tax free to your childs 529 account for college. It’s pretty cool. Cool! I think there is so much free money I’m missing out on. RhodeyGirl did a post once about her American Express card. I don’t use any kind of rewards credit card, but i guess I should! Seriously though if you have a business credit card look into it. We are with HSBC. You should definitely look into getting a rewards card for business purchases. I would suggest Discover. You get 1% cash back on all purchases and 5% on special promotions each month (ex: gas, travel, groceries, entertainment). OMG! I am gonna have it for breakfast tomorrow 🙂 Looks delish! So yummy!! I also just wanted to say how awesome you guys are with Karen. I can only imagine how difficult chemo is, let alone when it is a close family member, and the way you guys care for your family is a great example for people. Hope she is feeling better! I love, love, love my Moving Comfort Fiona bra! It’s the first sports bra I’ve ever found that actually holds the twins in place! It’s the best! I love Ebates – especially for big purchases! Your oatmeal looks lovely – I’m always too tired in the AM to make something different, but if I started overnight oats, I think I could do it! I swear I told you about Ebates FORever ago 😉 I’ve been using it for a couple years now! The cash back goes directly into our PayPal acct (We use to get checks, but that seemed silly!) Its so easy to use, just one extra click! Those oats look so YUMMY! I used to love Groupon in Charlotte, but Cville is too small for either!! I use Groupon/Roanoke market. Love it! I’ve noticed lately there have been quite a few Cville offers listed under the Richmond Groupon page. For example, today there is one for Ragged Mt Running Cville. Oooo! That oatmeal looks DE-licious! Oh, Do you use Groupon.com and LivingSocial.com? Two other great websites that offer AMAZING daily deals! Half off to restaurants, hotels, local attractions, etc. I’ve even bought half off coupons for froyo, Hand Picked, and Nutty Boys! I love the idea of mixing in bread! That’s genius! oooh brilliant idea! Doughiness FTW! I haven’t seen this on your blog in ages. Was this a once and done type of recipe? I forgot about this recipe!